We are stoked to announce our new release schedule and give some insight on everything going down in 2018. This long-awaited lineup will include new packaging, a year-round beer to add to the brewery's ever-growing portfolio, and a whole year's worth of new limited and seasonal beers hitting package for the first time. Check out all of the details below! Our Core Brands are a lineup of balanced, year-round beers meant for any occasion. New this year is Vibin’ IPA. This crushable India pale ale is a groovy 5.8% with vibrant layers of tropical flavor and aroma from loads of late-addition citra and mosaic hops. With a crisp, balanced body, Vibin' is inspired by the feeling you get from listening to great tunes with a beer in hand. It will debut in March in 12oz cans and bottles. Our Limited Core is composed of two biannual releases that are both funky favorites: No Crusts Peanut Butter & Jelly Brown Ale and Last Snow Coconut & Coffee Porter. Over the past few years, we've received tons of awesome feedback for these beers and knew we had to do something about it. Our loyal fans have been asking for bottles of No Crusts for a long time, so we're excited to have the opportunity to not only provide them with No Crusts but also a new packaging format for Last Snow! Each beer will be released twice a year in four-pack, 12-ounce bottles and draft. The Goodness Series is a our completely new lineup of seasonal release beers. This new series will include a few, new experiment beers along with a couple highly-acclaimed favorites. Each beer will be released in three-month intervals in four-pack, 12-ounce bottles and draft. The Little Buddha Small Batch Series returns this year with three returning favorites and three brand new beers! I Want It Now! 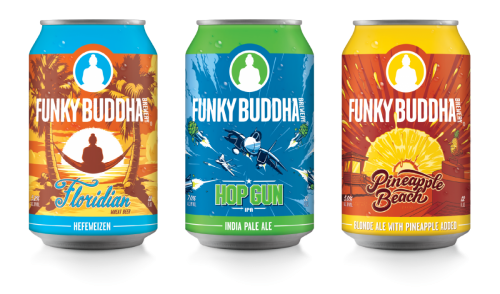 Tropical Gose, Black Currant Tripel Lindy, and Save Some Room For Later Double Brown Ale join the squad adding variety in style and flavor to the Little Buddha lineup. 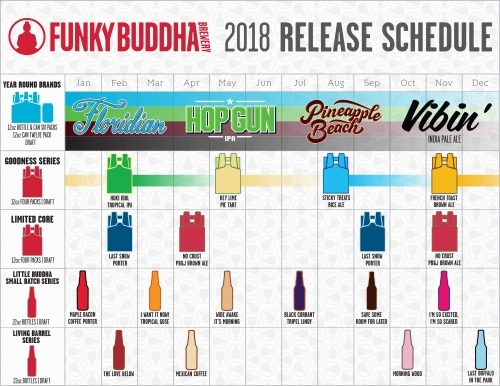 We’ve also changed the release schedule this year for the Little Buddha Series from monthly to bi-monthly. Each beer will be available in 22-ounce bottles and draft. Wide Awake It’s Morning: Imperial Maple Bacon Coffee Porter! The Living Barrel Series is back! We have expanded our barrel-aging program to include a multitude of unique wine and spirits casks including whiskey, rum, Tequila, Cabernet, and more. Each barrel-aged beer will be released in 22-ounce bottles and draft. The first two of these releases will see a larger release to distribution for the first time, while our highly acclaimed Last Buffalo and Morning Wood will be back again to end the year right. This year we'll also see releases of limited Living Barrel Series beers, special release drafts, and anniversary beers throughout the year as Florida and tap room exclusives. You never know what we might do, so stay tuned to our social media channels for updates on release dates, special releases, events, and more!